Firefighters battle a blaze at a Los Angeles paper recycling facility. A recycling facility in downtown Los Angeles suffered a major fire leaving one firefighter injured, officials said. At 3:15 p.m., another fire alert reported the 89 firefighters battling the blaze had managed to “control all active flame” within two hours. They stayed at the scene, however, into the early morning hours to make sure it stayed completely extinguished, officials said. Authorities initially said no firefighters had been injured and the 50 workers at the facility were able to escape unharmed. The 14,000-square-foot recycling facility is full of baled paper goods, according to the fire department. Earlier, when firefighters were responding to the blaze just before 1:40 p.m., another alert from the fire department described “heavy flames outside and throughout” the massive structure. 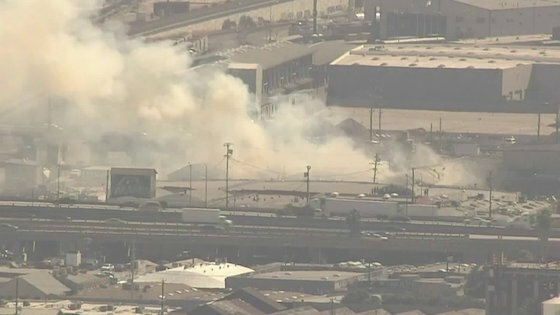 Just after 3 p.m., a fire alert said “a light on-shore breeze” was bringing an odor of smoke from the fire to a nearby Boyle Heights neighborhood. Authorities are still assessing damage to the building and possible damage to adjacent structures.